I am a self taught artist, who works full time from her studio in Oregon City, Oregon. I quit my day job a year ago, moved 2200 miles west back to Oregon, and set my studio up here. I've been on Etsy 4 years, and quitting my day job was a big leap of faith that it would work. It truly has, and it's a joy to create one of a kind pieces daily. I work with copper core wire in 8 colors, and Sterling Silver. I specialize working with Eyes as my main focus, but receive an occasional serious work on commission. I sell 95% of my work on line, and have a local gallery and Williams College of Art, as my other outlets for my work. I paint my eyes, and often I will get requests for special colors that I try to fill. 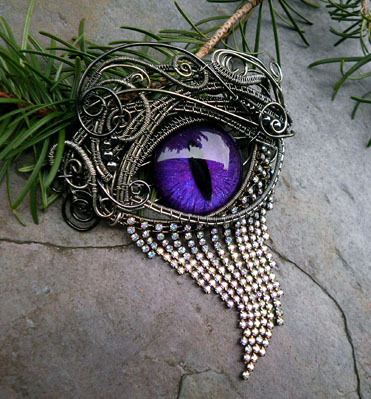 When someone wishes for a purple eye ring, I will paint up to 5 eyes, for them to choose from, and I send my pictures to them via the web. It's a very special process and my secret how it's done. I have sizes of glass from 14mm to 32mm, and can get smaller and larger, with time for a special order. My work travels all over the globe, and I ship daily, priority mail. My best ideas come from my customers and about 50% of my work is now done by request and on commission. Wow! Amazing Work!! The artist is really talented. I've told Jill myself that I'd love to do work like hers. 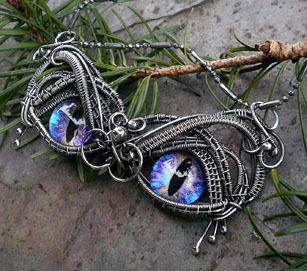 The wirework fascinates me. Lovely and amazing. Thank you so much for posting about Jill. 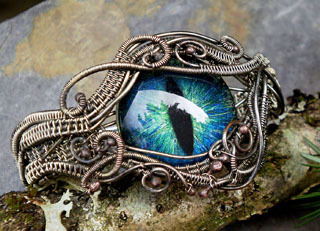 I went over to etsy and drooled all day..click clicking to decide which I wanted and low and behold one jumped in my cart and Jill mailed it right out. I can't wait to get it. Thank you so much, for all your kind words. I am truly honored to be here and on Etsy and able to earn a living doing this. I has become clear since being featured here, and after receiving comments from many of my customer and friends, that to be an independant artist is a rare thing indeed. I'm thrilled to show you my new shop, and to reside in it daily is a joy beyond description. Here's a link to share my home and studio. I look forward to seeing more and hearing from each and every one of you. Creative, fascinating, unique, very lovely and skilled art!